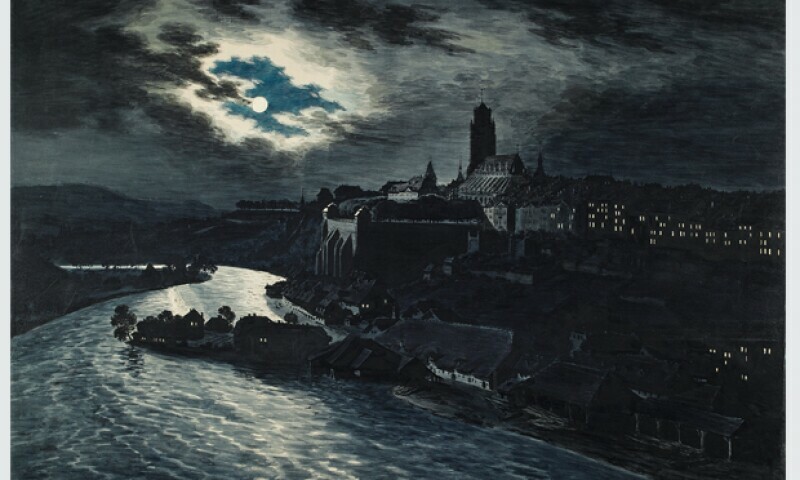 Franz Niklaus König, The city of Bern in the moonlight photographed by Muristalden, c. 1810. Watercolor on tracing paper, 84 x 119 cm. Bern Art Museum, Bernische Kunstgesellschaft, Bern Acquisition by the Bernische Künstlergesellschaft 1867. Fifty years ago, Apollo 11 landed on the moon. The exhibition shows moon pictures from different epochs. The moon appears as a lighting of nocturnal landscapes, sometimes in a variety of allegorical ways, even as an anthropomorphic vehicle of one's own state of mind. In opposition to the sun of the day, he becomes the representative of the night, the dark, rationally not penetrating, terrible, the wonderful, the feminine, the healer as well. On display are works by Hans Sebald Beham, Balthasar Anton Dunker, Franz Niklaus König, Ernst Kreidolf, Paul Klee, Nell Walden, Meret Oppenheim, Claude Sandoz and others.